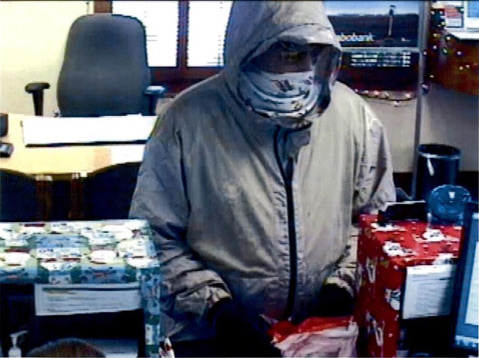 Police detectives released security camera photos of a male suspect who, clad in a grey windbreaker and sunglasses, robbed Santa Barbara’s Bath Street Rabobank branch in the afternoon on Christmas Eve. According to a written statement released Tuesday by police, the man allegedly robbed the bank located at 2222 Bath Street at approximately 12:57 p.m. on Thursday, December 24. Rabobank’s surveillance footage shows close-up images of the apparently hefty suspect, who wore black gloves and concealed his face. Community members with information on the incident may call Detective Chad Hunt at (805) 897-2344 or anonymously at (805) 897-2386.